At this link, you’ll find a typical recipe for traditional Italian Braided Easter bread with colored eggs stuck in it. 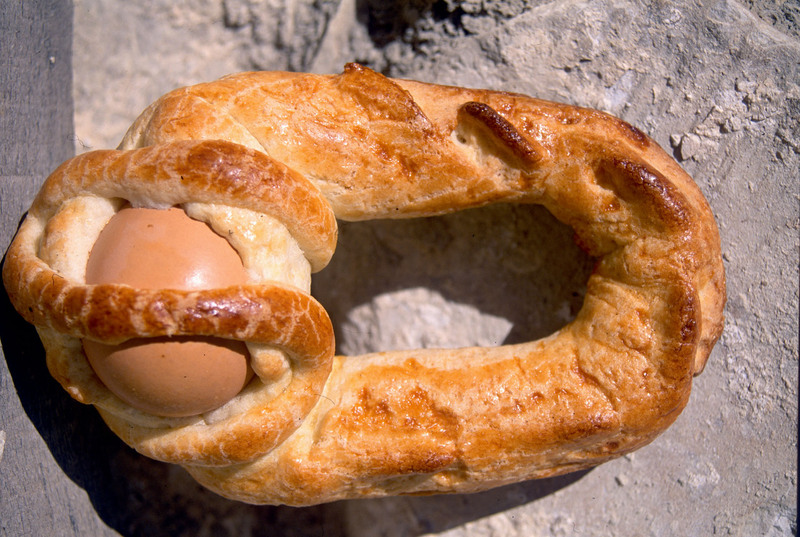 What is the origin of this Braided Easter Bread tradition? We asked a well-known professor of Italian Studies who said, “There is no answer, “origin unknown”. He also commented that bread is symbolic of life, a circle never ending, red eggs represent the blood of Christ. “Saturday is a day of silence; everyone is mute due to the absence of their Lord. The ritual of Easter Sunday begins late in the evening of Saturday with a solemn liturgy, the Easter Vigil. The shadows, which seemed to triumph in the Passion of Christ, come to be pierced by the fire of the Easter candles, symbolizing the Risen Christ who triumphs over the powers of darkness. Now the costumes are completely changed into joyous garments. “Christ has truly risen and the hearts of the believers are filled with joy.” At midnight “si sciuogghinu”, the bells, are “untied” and a discontinuous and joyful peal announces the Rebirth. It is the passage of Our Lord from Death to life; the passage of man from the servitude of sin unto grace. It is the triumph of Good over Evil, of God over the Devil, of Life over Death. In the morning the festival bells call the faithful to celebrate joyously the risen Christ. After the Holy Mass, the ritual of the easter Supper takes place. 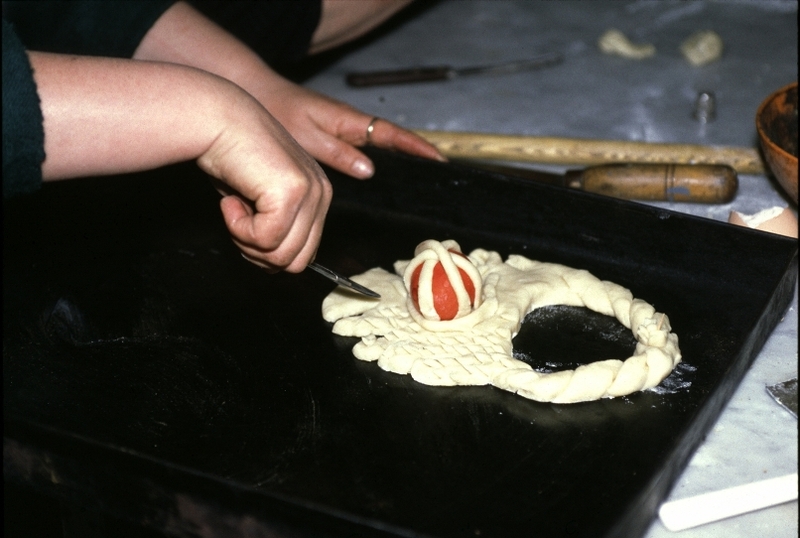 Among the many delicious items of Calamignese food on the table, the traditional Easter sweets prepared the previous day by the skilled and hardworking women of the town are to be found; the “U pupu cu l’uovu” (the “doll with the [hard boiled] egg”) and “i palummièddi” (the “iced doves”) both sweetened with a rich glaze “a marmuràta” (or “marbleized”). But what is the history of this Easter bread with the colored Eggs stuck in top? “La coddura o cuddhura , is a typical Sicilian cake, prepared before chocolate was known on the island (Sicily). The cuddura (from the Greek kulloura, meaning “corona”, in English “crown”), is a ring-shaped cake. In antiquity shepherds or wayfarer prepared it; and they slipped it on a stick, or the arm, and carried it around with them. It is typically a Sicilian cake, but also found in some areas of southern Italy. It is eaten through the Easter season. During the period of Lent, moderation is observed and meat, eggs, and cheeses are excluded from the tables, but with the arrival of Holy week, deprivations end, and eggs are used in the preparation of Easter cakes. In Sicily, today it is still the more widespread Easter cake. Its origin is not sure. It is like a large circular cake with varied, but always uneven, with eggs incorporated, in their shells…predominantly red, to represent the blood and the suffering of Christ”. Young women used to give it to their fiancé on the day of the Resurrection.” “But the form of the cuddura is not only circular: they are prepared also in the form of “campanaru” (bell tower) to recall the tolling of bells for the risen Christ, in the form of “panarieddu” (little basket), to wish abundance, or of “gadduzzu” (clock or dove) for boys, “pupa” (doll) for the girls, and “heart” for beloved parents. If your family has a tradition of making this braided Easter bread, or any other treasured traditions relating to Easter, we’d love to hear your comments on our Facebook page ! I will repost this blog there.